Two nanosatellites made by Skolkovo resident Sputnix were launched into outer space on Wednesday by cosmonauts during a spacewalk from the International Space Station (ISS). The launch of SiriusSat-1. Video: Sputnix. 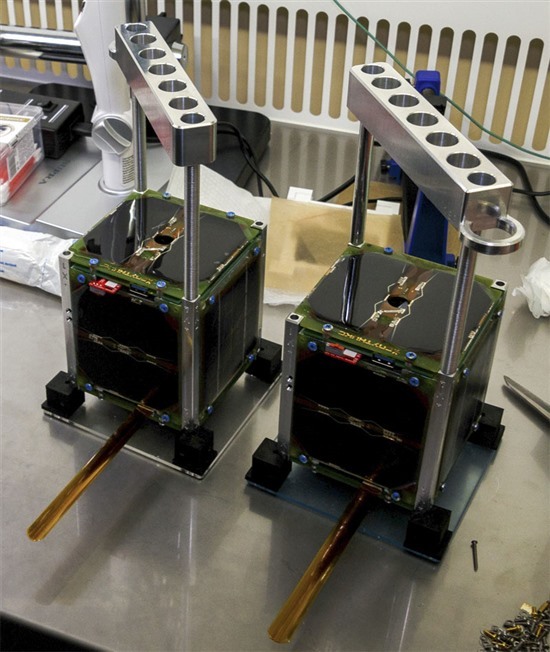 The SiriusSat-1 and SiriusSat-2 satellites, weighing 1.45 kilograms each, are carrying payloads of cosmic ray detectors that will help to research space weather such as solar wind, which can affect technology on Earth such as radio and radar, as well as satellites themselves that people rely on for weather forecasting and GPS. They were launched into open space by Russian cosmonauts Oleg Artemyev and Sergey Prokopiev during their planned spacewalk on Wednesday evening. The CubeSat satellites were given a handle to enable the cosmonauts to simply release them into space, and were due to start transmitting data 15 minutes after being activated by the cosmonauts. The satellites will now be flight-tested, and will confirm via radio channel their capabilities for stabilization and data acquisition and transmission. The Sputnix team will monitor the satellites from its control centre located at the Skolkovo Technopark, and has installed a tracking antenna on the roof of the Technopark for this purpose. The research data and telemetry will be receivable via amateur radio ground stations all over the world: the satellites will go by the call signs RS13S for SiriusSat-1 (frequency 435,570 MHz) and RS14S for SiriusSat-2 (frequency 435,670 MHz). Among those watching the launch with bated breath at Mission Control Centre in Korolyov, in the Moscow region, was a group of schoolchildren who had worked on the satellites at the Sirius centre for gifted children in Sochi, as part of a joint programme with the state space corporation Roscosmos. They assembled the satellites in collaboration with specialists from Sputnix using the OrbiCraft-Pro nanosatellite platform designed by the Skolkovo resident company. The SiriusSat satellites were given handles so that cosmonauts could release them into space. Photo: Sputnix. The school pupils who worked on the satellites at Sirius presented their work to Russian President Vladimir Putin when he visited the centre in July 2017. The students used the opportunity to ask Putin about the possibility of launching their satellites into space. With help from Roscosmos and the Energia Rocket and Space Corporation and funding from the Innovation Promotion Fund, the satellites were assembled and subsequently delivered to the ISS on July 10 by the Progress MS-09 transport vehicle. Students at Sirius are now working on the next series of SiriusSat satellites, Sputnix said, with plans to launch a constellation of academic satellites that, together with a network of ground stations, will allow scientists to oversee the state of space weather at low Earth orbit in real time in different parts of circumterrestrial space. The data from detectors and telemetry will be made available for analysis to all students of space clubs, student labs and radio amateurs in Russia and abroad, the company added. Sputnix, which makes microsatellites, components and services, including Earth infrastructure for testing them, was founded in 2011. Four years ago, it built and launched Russia’s first private earth remote sensing satellite, the TableSat Aurora, using a microsatellite platform developed with the help of a grant from the Skolkovo Foundation. The company focuses closely on developing and creating equipment for schools and educational centres for training specialists in the aerospace industry.